One of the preferred drug applications is oral drug administration. As per the Biopharmaceutics Classification System (an FDA system that differentiates drugs on the basis of their solubility and permeability)1, the number of poorly soluble drugs has increased in recent years and only a few of the new drug molecules are characterised with having both solubility and permeability. To achieve the desired pharmacological effect, however, bioavailability and hence the solubility of the drug is of prime importance. According to the Noyes-Whitney equation* the dissolution rate can be significantly increased by particle size reduction. 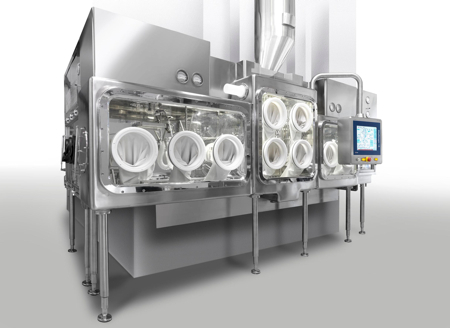 Reduced particle size is also a crucial factor for the success of inhalation therapies. Only a few techniques can break down particles to within the desired size range, one of which is controlled micronisation. Spiral jet mill micronisation of solid materials in either standard, contained or aseptic format is an area of expertise of Dec, a producer of powder handling, isolation and containment systems. Spiral jet mill micronisation is one of the superior milling technologies producing dry, ultrafine particles (>1–5µm) in continuous or batch operation under well controllable process conditions, without subjecting the material to thermal stress. When looking at alternatives starting with mechanical mills that grind powders by friction, cutting or compressing, such as hammer and pin mills, these may create issues, such as heat generation, lower size limits of around 40µm and the fact that they are not easy to clean and maintain. Another method of micronisation is categorised as fluid energy mills. These milling systems work according to the particle collision principle and include the spiral jet mill and the opposed or fluidised-bed jet mill. Opposed jet mills provide two or three opposed gas jets and a reactive air classifier controlling the particle size above the jets. The powder is fed into the lower portion of the grinding chamber by a gravity feed inlet. The particles collide, decrease and flow up towards the mechanical classifier which selects the fine particles by negative exhaust pressure and rotating speed into the collection system. Coarser particles return to the milling zone, where they will be reaccelerated for another collision cycle. One of the principal downsides, besides abrasion due to mechanical parts, is the fact that fluidised-bed jet mills may be difficult to clean depending on the dimension and the number of components; this can lead to potential contamination issues. State-of-the-art micronising technology should improve bioavailability through particle size reduction via a controlled process while meeting cGMP regulations, achieving high yields with low energy consumption and allowing for easy scale-up and cleaning. Dec’s spiral jet mills consist of a flat, cylindrical grinding chamber using a venturi injector which creates an initial negative pressure to convey the particles into the central chamber at subsonic speed. A series of specially designed nozzles increases the acceleration to supersonic speeds (300 - 500m/s) in a spiral movement. The particle size reduction is generated by the collision of the rotating particles with those entering the milling chamber in a precise and controlled manner using kinetic energy. Once the particles have achieved the required size, they flow with exhaust gas towards the cyclone where they are separated from the gas by a specially designed filter. A new generation of jet mills – the MicroJet series – has been developed with Computational Fluid Dynamics (CFD) simulation software to analyse ‘dead’ areas within the existing mill geometry where turbulence causes powder to build up and eventually leads to clogging, i.e. time-consuming and expensive downtime. The help of the CFD simulation allowed the design team to study the airflows in jet mills and to optimise the internal surfaces and shapes as well as the jet nozzles. The enhanced internal geometry of the MC Jetmill MicroJet series has provided increased velocity within the mill chamber and reduced turbulence within the mill, achieving an even finer and tighter particle size distribution. The award-winning MCOne in the MC range, is a jet mill specifically designed for small quantities that achieves excellent results in the area of research. Combined with the new Microjet 10, whose milling chamber is completely interchangeable with the MCOne and which is also designed to micronise milligram quantities, it can meet the demands of R&D users to an even greater extent by being able to micronise microgram quantities and achieve very high yields. The Microjet 10 is equipped with an outer product charging and collection point; therefore, it can micronise repeated batches without having to open the mill chamber. 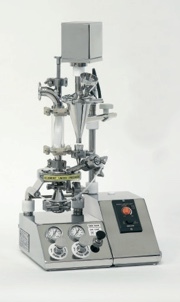 To achieve a constant mass flow into the new Microjet 10, Dec has developed a new manual dosing system called Rota-Feed that enables three different quantities of input material – 50, 500 and 1500mg (depending on the experiment) – into pre-machined powder feed channels in the top of the mill. This Rota-Feed system enables the mill to be fed via a simple rotation of the disk. 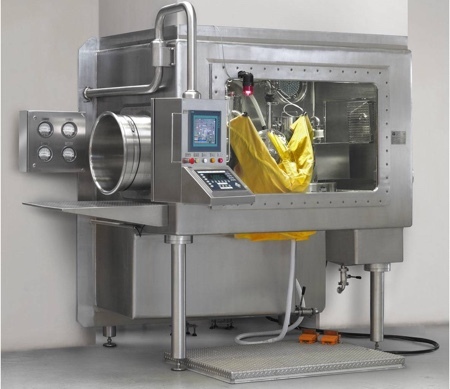 Due the increasingly potent nature of pharmaceutical ingredients, jet milling isolators meet the containment requirements for both highly active and sterile compounds, guaranteeing operator and product protection. A recent Dec project consisted of the supply of a special half-suit operated isolation system featuring a through-the-wall design allowing the isolator services, motors, filters etc. to be executed within the technical area. 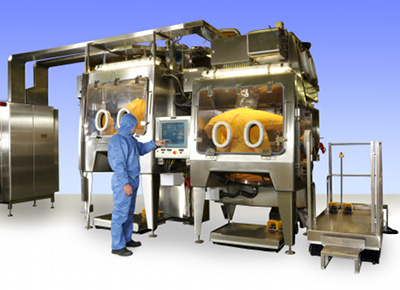 The isolator ensures containment to a working occupational exposure limit (OEL) of <50ng/m3 time weight averaged (TWA) over an 8h period and operates within an ATEX Zone 2/3 G/D IIB T3 classified process room. Given the product toxicity, it was designed to operate under negative pressure to the outside environment with special HEPA filtration on both the exhaust paths and the inlet to the system. The isolator integrates two milling processes, an MC200 fluid energy mill and a cryogenic version universal mill processing at temperatures down to -20°C, both of which operate on an interchangeable basis. The micronisation takes place as a linear process with an area being provided in the work surface of the chamber. Micronised product is conveyed to an integrated cyclone filter allowing contained access to the cyclone filter sleeves. Product discharge from the cyclone is into a buffer vessel from where it is then conveyed via a Dec powder transfer system to a contained pack off station. The grinding chamber is fed by a through-the-wall volumetric feeder. To enable the jet mill to operate as a closed system the mill venturi feed line is equipped with a closed system with integrated gas purge to the feeder and mill, removing the need for a balance line to the cyclone filter, thus removing additional set-up and cleaning. 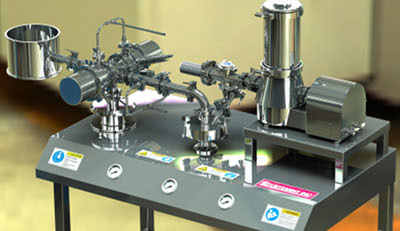 The micronising process operates with nitrogen only and is equipped with an automated inertisation system with an integrated oxygen analyser. 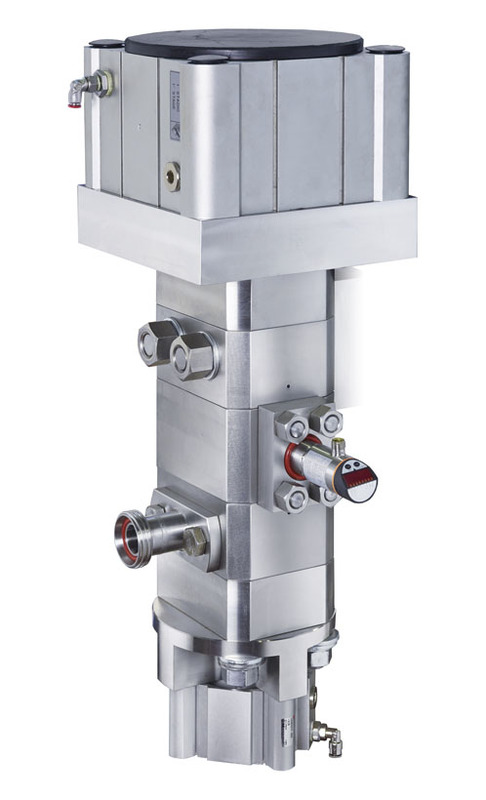 Process interlocks prevent the micronising system from operating unless a predefined oxygen concentration level has been met. APIs are automatically fed into the feeder hopper by a powder transfer system drawn from the previous process station. This operation is connected to the PLC which controls the level inside the feeder by use of level sensors. From there the product is conveyed into the venturi of the micronising jet mill and further into the grinding chamber. Gas is fed into the outer chamber of the jet mill where it is then forced through the jet nozzles spaced around the periphery of the chamber and at tangential angles. The nitrogen is discharged into the fluid outlet at the centre of the jet mill, which carries the smaller sized particles out of the milling chamber into the cyclone filter for separation, while the coarse particles are thrown back into the fluid jets for further reduction. Once the gas/product separation has taken place, the exiting process gas from the micronising system will pass through double efficiency HEPA filtration before exiting the isolator. 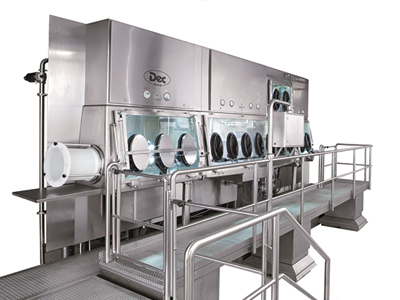 The filters are of the safe change push type and contaminated filters are pushed into the isolator and removed via a rapid transfer port endless liner system. The micronising isolator has been designed with a clean-in-place system using a series of spray nozzles and spray guns strategically positioned throughout the plant. 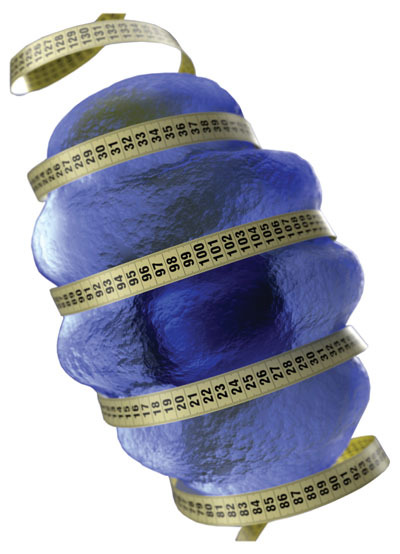 In conclusion, micronisation technology is the preferred method to obtain consistent results in size reduction. However, it requires knowledge and expert advice for optimal system design, taking into account the product properties – a critical factor to the success of any project.